Although I know that shouting at computer components is unlikely to make them magically fix themselves, it somehow makes me feel a bit better. Hard drives, monitors, soundcards and even keyboards have all felt the sharp lash of my tongue when they decide to stop working properly, but there is only one component that gets me so angry that I want to lob the fecking thing out of the window. Yep, we're talking about my printer. My useless Epson Photo 985. Cursed with a jazz approach to functionality, it's a moody number with a teenager's approach to getting up. Sometimes it decides that it doesn't want to be disturbed from its nap, and no amount of bashing buttons or whispering encouraging words into its nozzles will change that fact. Other times, it will burst into life with such enthusiasm I can only assume it's ingested some sort of ink-based amphetamine, as reams of (often unrequested) copies keep on spitting out of the printer. To be fair, the Epson's been a bit flaky for some time, although it only started really playing up a few days after its guarantee period expired (cue conspiracy theories about manufacturers building in pre-planned obsolescence. Or the printer just knowing). Despite its quirks, it's usually got there in the end after some shouting and prodding, so I've persevered with it over the years. 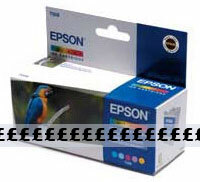 That is until this weekend, when it decided to go really downhill, with a near terminal decline timed to perfectly coincide with the delivery of a box of expensive new Epson inks (and yes, I have been buying the proper inks, despite the eye-wateringly expensive prices). My printer clearly harbours some artistic ambitions, getting creative with my printouts by adding random lines, banding and sometimes even a psychedelic effect where individual colours are removed. Naturally, the 'clean heads' option has little effect (apart from draining ��� inks at an accelerated rate) but just when I'm about to give up on the thing completely - whoosh! out comes a perfect print, with deep blacks and vibrant colours. Sometimes it does this to lull me into a false sense of security: if I need to produce a photo quality print for a client, it'll produce a perfect test print on bog standard paper, but as soon as it detects the lush lustre of expensive photographic paper, out come the usual streaks, bands and missing colours. As an added tease, it's also partial to starting off with a prefect print, and then letting the image slowly degrade until there's barely a ghostly image left at the end of the page. It's not all moody misprints though, with the Epson liking to wind up my desktop PC with prolonged hide and seek sessions. 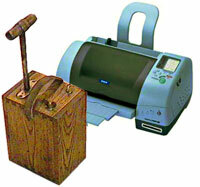 I'll be working on a document, I'll press 'print' and - wooargh! - the computer's telling me that the printer has somehow vanished off the face of the earth but, no - it's still right there on the shelf in front of me. "WHAT DO YOU MEAN YOU CAN'T FIND THE PRINTER?! It's right there - look! - where it's always been. RIGHT NEXT TO YOU, you useless piece of crap!" Even when the Epson has deigned to let the desktop speak to it, the printer will suddenly shun all requests to print a document, producing a baffling 'communication error' onscreen. This basically means, "there is nothing you can do now until we decide to let you print again." The only way to defeat this electronic rebellion is to reboot the machine - which can be a right pain when you're in the middle of something. Mind you, it won't forget about those documents that it's refused to print, so even when I've cancelled the print run and sent it to another printer and rebooted my PC, the Epson will suddenly spring into life - sometimes days later - and churn out endless copies of a cancelled document that it's been secretly harbouring in its cache. 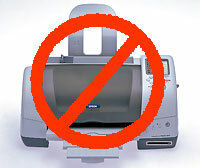 Like Hal in 2001, the Epson doesn't like to be turned off either, so attempts to cancel 'stuck' documents by switching off the printer can be punished with an unexpected PC system reboot (how does it do that?!). No one could accuse me of not trying to get the thing working either: it's been uninstalled, reinstalled, moved about and plugged into a host of different USB ports and computers. It's had new drivers, old drivers, Peruvian incantations and prayers to the great Gods of the Ink Droplets. Occasionally, the printer takes a dislike to the music being played in the office and decides to start up a tune of its own, settling down to enjoy an elongated period of experimental electronic music involving random whirring, hissing and whining noises. This mechanical racket can go on for some time, with long, teasing pauses in-between leaving me unable to concentrate as I wait for the next irritating bout of shuffling to kick in. One thing I can guarantee with near 100% certainly is that the really big printer problems will rear their head whenever there's some sort of urgency involved. About to go out and need to print off map directions? Cue instant printer meltdown! Need to print out a letter in time for the last post? What better time for a random error message to appear! Have to send off an urgent document? The perfect time for the ink readout to go from 75% to zero mid-print! The very fact that I've found myself ranting so long about a bloody printer tells me that it's high time I dumped the chump and bought a new one. Which I'd love to do, except I've got that big pile of freshly purchased ink cartridges sitting unused on my desk (naturally, they're only compatible with a handful of current printers and only work with Epson), so me and Epson are going to have to stick it out for a bit longer. It'll be like Thatcher and Scargill stuck on a small desert island. Meanwhile, my girlfriend's older, cheaper, bottom-of-the-range printer continues to churn out top quality prints day after day. Maybe she's just got a better personal relationship with her printer than me.